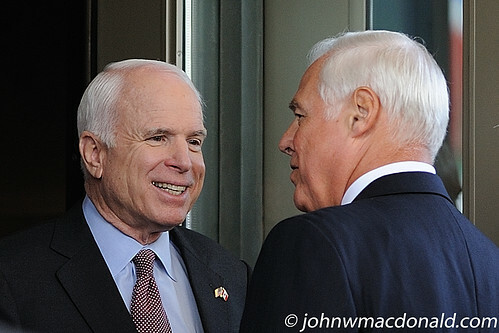 Senator John McCain in Ottawa, originally uploaded by johnwmacdonald. Senator John McCain, the Republican nominee for president of the United States, visits Ottawa Friday 20 June 2008 to deliver a free trade speech to the Economic Club of Canada. McCain has a few parting words with Fairmont Château Laurier's general manager Claude J. Sauvé as the Senator is whisked away by motorcade at the side entrance of the hotel.